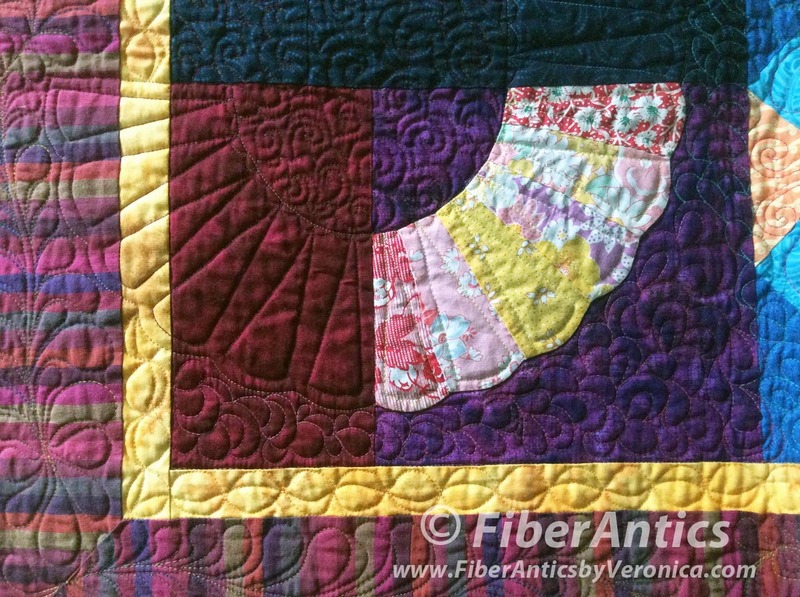 Fiber Antics by Veronica: Have you ever collaborated with Anonymous? Have you ever collaborated with Anonymous? Using vintage textiles in new quilts. About 10 years ago, I purchased a stack of unfinished vintage Dresden Plate rings online. Several full rings accompanied a handful of half and quarter rings and a few random blades. The fabrics were charming and the prints were cheerful vintage feedsack prints and other 1920s and 1930s small scale patterns. These Dresden rings were hand pieced. Serendipity stepped in one day and they happened to be lying beside a stack of blocks that I made in a Marti Michell learning-to-work-with-templates workshop. Hmmm.... they look pretty good together. Hmmm.... could they play together in a quilt? Let's see if this will work. And so became this quilt, "Dresden meets Marti at Riverbend." 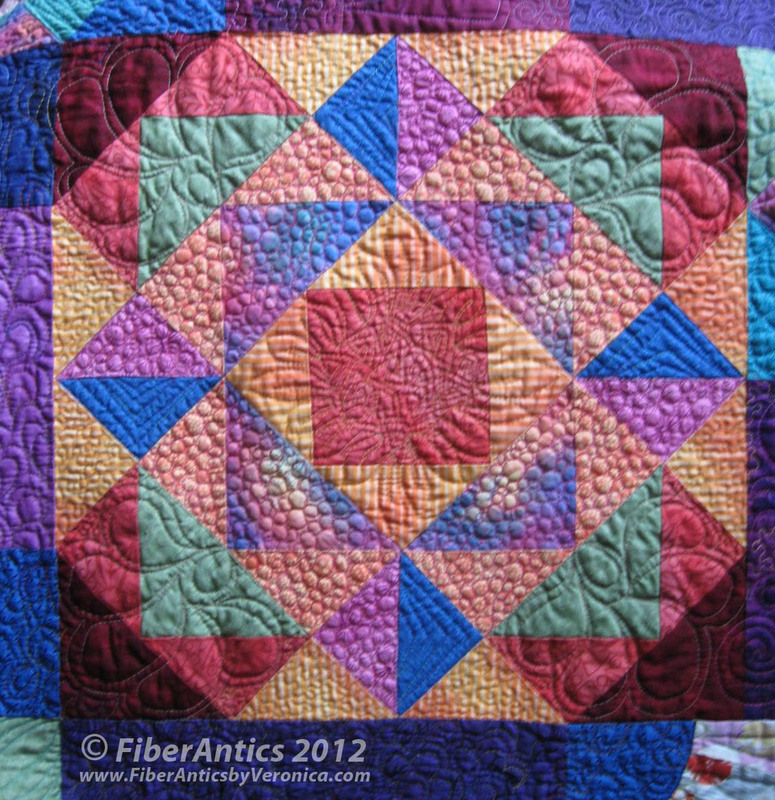 This is another quilt I brought to the "Back to the Future" kick-off meeting at the Choo Choo Quilters guild. Here is the quilt hanging in the Georgia Quilt Show in 2010. "Dresden meets Marti at Riverbend"
If you're familiar with Chattanooga's annual Riverbend Music Festival, you can envision the various music stages and concession tents that line the street paralleling the winding Tennessee River that runs through the city. Although traditionally placed on a light background, my vintage Dresden pieces felt right at home on the darker, contemporary tonal fabrics. 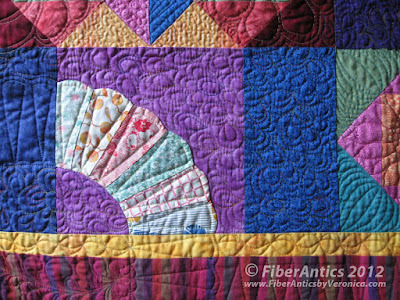 Vintage Dresden fans stand out on these dark backgrounds. The curved appliquéd Dresden rings nicely complement the angles and geometric shapes in the patchwork. 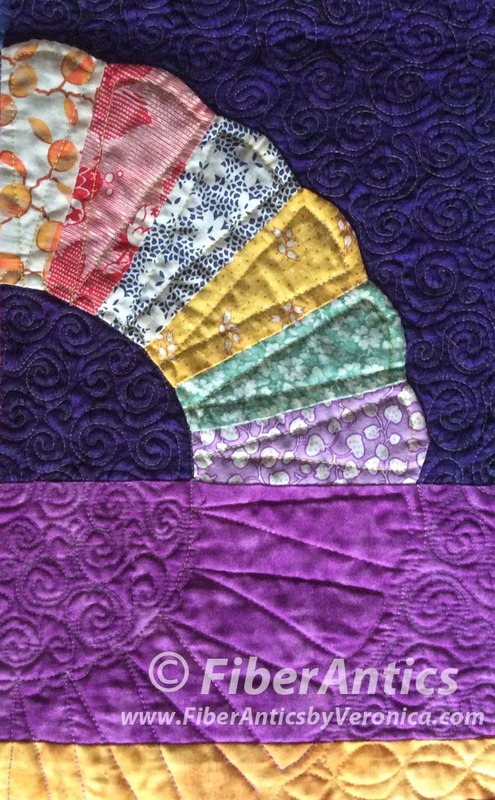 Free-motion machine quilting on my Dresden time-span quilt. I took cues from the fabric prints for the free-motion machine quilting designs. 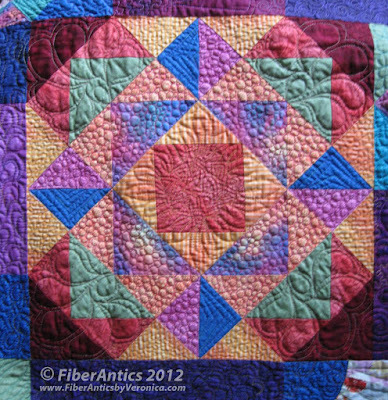 This quilt top was a bit like assembling a jigsaw puzzle that had pieces missing. Spacer blocks were used to fill in the areas between the appliqué and pieced blocks. The asymmetrical layout, however, lends itself to the festival theme. 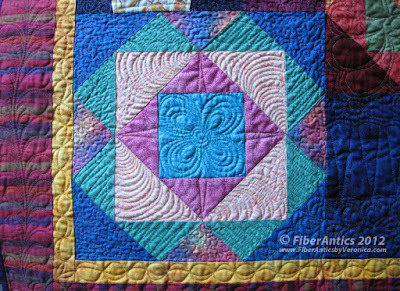 The interplay of color and stitch connects the two sets of quilt blocks as well as the different generations of the quiltmakers. Who says you can't mix hand and machine piecing? And these blocks were from two different centuries! Detail of "Dresden meets Marti at Riverbend" quilt. This was a fun time-span quilt to make. Both the Dresden rings—hand pieced by an anonymous quilter—and my workshop quilt blocks found their way into a completed quilt. And I believe a finished quilt is always a good thing. For Ms. Anonymous and me, this might not otherwise have happened if we hadn't collaborated.